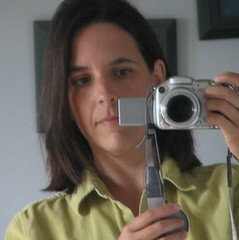 I am on the "Roll Call of Environmental Honour"! In 4 pt.! You may not know this about me (I willl come up with 7 more soon, Chloe, I mean it), but I am a fan of Formula 1 car racing. 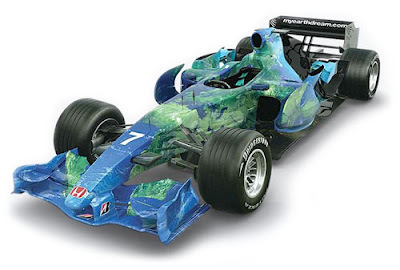 When I heard that Honda was promoting the environment and sustainability with this seasons' race car, I was thrilled. And then they gave the public the opportunity to make a pledge and have their name put on the car for one race. This weekend is my race. France. Watch your screens closely, as my name will be there in 4 pt font for all to see. That's right, folks, you heard it right: 4 pt!! YOUR NAME IS ON THE CAR! We have exciting news! Your name will be on the Earth Cars at this weekend’s Grand Prix in France. Your name will be in 4pt so it’s clearly visible with the naked eye close up, but our clever designers have applied them in such a way that our beautiful artwork still looks the same from a distance.We have put all the names in columns and like to call it our ‘Roll Call of Environmental Honour’. All of your generous donations will be distributed at the end of the season and we will update you with news of the environmental projects and organisations that benefit as soon as details are available. We’ll also be launching a brand new website later in the season that will have many more exciting interactive features and regularly updated news about myearthdream. We want to take this opportunity to thank you for your enthusiasm for the myearthdream project. We have been overwhelmed by the response and are grateful for all your letters and emails of support, but mostly we’re grateful for the collective difference we’re making to the planet. Look closely at this face. The entrance to your establishment smells of urine, my babe's highchair was covered in the filth from former babes, beetles fell from the ceiling above our table (seriously), the waitress could not differentiate between apple juice and milk (which was sour), our bill was incorrectly totalled (not once, but twice, resulting in a 10% discount, so thank you for that...)and my shoes stuck to the floors of the bathroom (which I was afraid to look too closely at). Needless to say, you have some work to do before we return again. Please do not send any coupons as a favour. We will return after you have undergone substantial renovations. On Father's Day, we took the Great Canadian Railway through the countryside to Truro. Travelling by train in Canada is a big deal; not like Europe, where it is a rather common thing to do. It was the Babe's first trip on a train, and I thought he would explode from the excitement. In the car, asleep on the drive back home again, he was muttering "train...train...TRAIN" in his dreams. Good things always have to come to an end. Why is that, anyway? What good things did you do? a bookshop, and dinner here. Well, I am thoroughly and completely exhausted. Having both grandparents over for the Babe's 2nd Birthday party is a version of insanity. But we had fun. Even though my mother told me that my cake tasted like wallpaper paste (when was the last time she ate that, I wonder?) and then she proceeded to let a giant fart that Mr.C's parents were aghast to hear. The woman is in another dimension. One that extends far beyond the twilight zone. Anyway...the Babe had a very lovely day and it was a nice family weekend. Now, back to some form of reality. I can take no credit for this moment of ingenuity. Let's hope our children will save the world, for I don't think we're going to. I could write that I haven't been around much because I have been so busy working, but that wouldn't be the truth. I have been busy thinking about working, but not actually doing much of it. Every now and then (well, ok, often), I get into a creative mood and my mind rebels against mindless work. So this past week I have been spending a lot of time in book shops and organizing my photos and creating slide shows and going through crafty things and reading books. And drinking lots of coffee. And trying out new recipes. And the list goes on and on. I have also been working in between, but when I try to add up the sum of my accomplishments from the past week, there isn't much to show for it. I refuse to feel guilty, however. For why should there be guilt in pleasure. Right?